Pour milk into a blender. Add frozen strawberries, maple syrup, eggs and vanilla. Put lid on the blender. Turn on blender and mix shake for about 20 seconds. 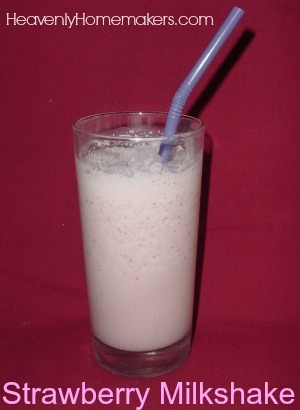 Pour milkshakes into glasses and serve with a straw! Could I do this without the eggs? Aren’t raw eggs bad for you? Yes, you can make this without the eggs. It’ll still taste great! I made these today for dessert and they were a hit! Tasted just like (melted) ice cream. We topped ours with whipped cream. When do you add the eggs?? Sorry, I just edited the post to tell you just to add it when you add everything else! Glad you pointed out that I didn’t have that in there! What if you didn’t have the free range eggs but did have pasteurized egg beaters? Are the eggs just for protein or do they add thickness? We just got a vitamix and this looks like just the thing for it! If I didn’t have free range eggs, I would just leave them out. The eggs are just for added protein and nutrition, but not necessary for the recipe. Yuuum! I am going to have to make this! The maple syrup is the sweetener – you could use honey or stevia or sucanat or even regular sugar if you feel okay about that! We just like using maple syrup! LOVE THIS!!! So simple. So healthy. The whole family loved it. Can’t wait to try different flavors. Is it ok to use skim milk? I raise chickens and wouldn’t put a raw egg in shake of any kind. I don’t think you realize how unclean that is. I love my birds but I watch them walk, scratch, peck in and dust bathe (they have mites) in their own feces. Because they live outdoors, they come into contact with wild birds that carry I-don’t-know-what kind of diseases or pathogens. I buy pasteurized in the shell eggs at the store whenever I use raw or lightly cooked eggs. In my household, it would serve about two people.